This final excerpt of Land Rentals, explains about the records or Rent Books that were kept to record payments due on the land rented. There is also comprehensive coverage of what records exist and how to access them. These are some of the questions that my colleague Jim Ryan of Flyleaf Press and Ancestor Network has answered in his definitive article on Irish land records or Rentals in his recent blog. The Rental or Rent-roll is usually a hard-bound book into which the details of all tenants are inserted for successive years. Some of these, especially for the larger estates, have very ornate covers. An example is shown below. Their internal layout during the 17th and 18th century rentals is usually blank pages with no columns, or with hand-drawn columns. In the late 19th century, pro-forma printed books became available with standard columns. 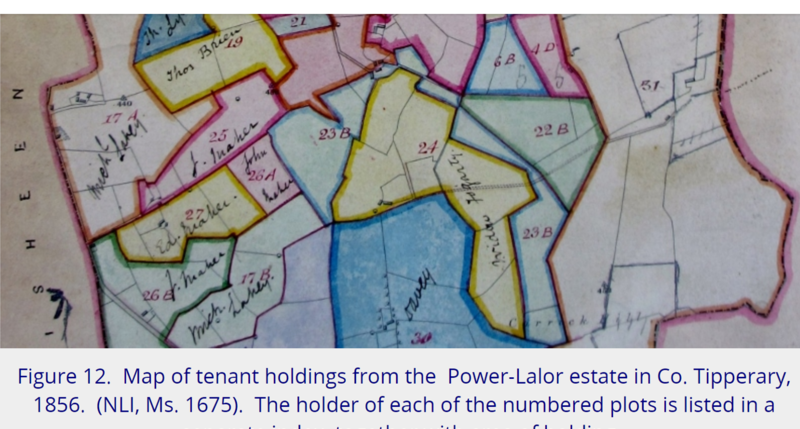 Although formats are variable, they typically list the tenants within each townland within the estate and (for each) the rent due, arrears, rent received, and observations. Some will also list the area of land within each holding, tithes due, and terms and other information on leases etc. Some have an index to all of the tenants listed, and/or the properties rented. Where can rentals be accessed? 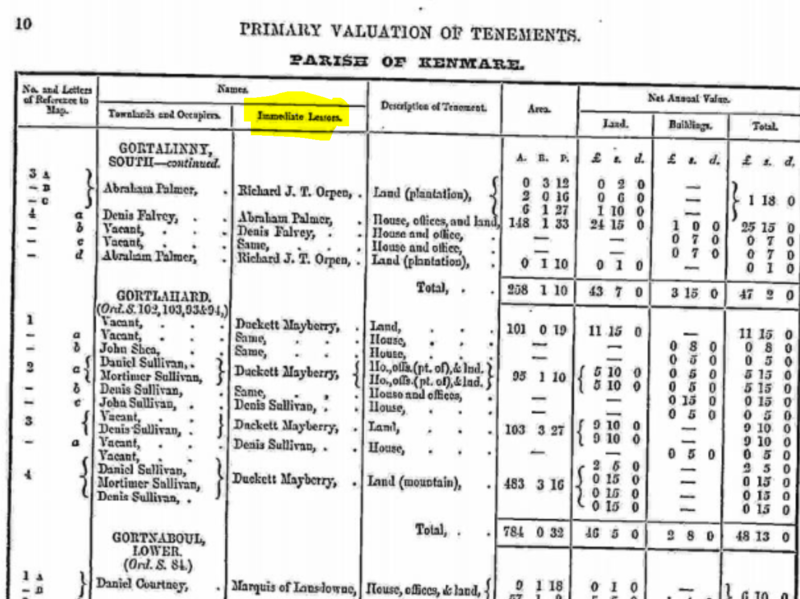 Fig: 13 An example of a rental in a brochure for sale of an estate in north Kerry with list of Tenants 1851. ‘Comprises the ordnance Townlands of Carigeen and Inchinapoagh in the Barony of Trughanacmy and County Kerry. On this Lot is an extensive and most improvable trace of moor with a new line of road through the centre of it. The Lands are held by good and solvent Tenants along the Southern bank of the River Feale (one of the best Salmon Rivers in Ireland), for about two miles. The Tenant’s houses are of a superior class, the road from Listowel to New-market runs through the entire length of the Lot, which is distant about 5 miles from Abbeyfeale and 10 from Castleisland, both good Market and Post towns’. So, how do you find the rental you need? Essentially, you will first have to establish the landlord in the area when and where your ancestor lived, and then search to see if their estate papers have survived. There are a few sources you can use for this. 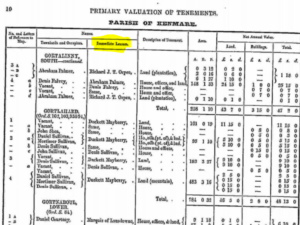 One source for the mid 19th century is Griffith’s Valuation which lists all land-holders and their landlords. 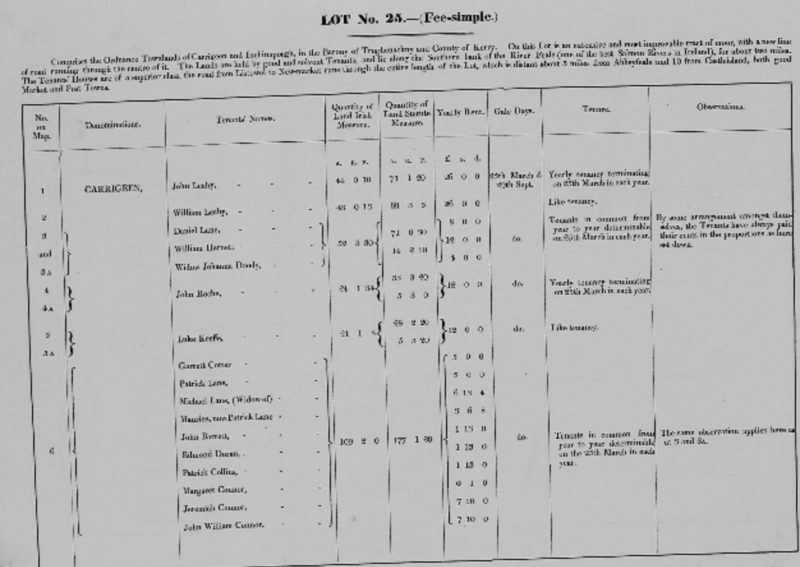 In this record is a column headed ‘immediate lessor’ (see Fig 14) which indicates the landlord for each property occupier at the time of the survey (1840s-1860s). Note that this person may be a ‘middleman’ (see above) who rents the land from the estate and then sub-lets to others. If this is the case, the tenant will not appear in the estate records as they are not a direct tenant of the estate. Kay, as always you stimulate the thirst for knowledge and genealogy. Your many blogs are very informative and welcome. I note that you are also a member of the Iveragh Peninsula Genealogy Group. Patrick Lyons and I are currently researching the name, Lyne, Lyons, Leyne and other variations from Iveragh and the greater Kerry area. I recently called to the Valuations Office, Irish Life Centre to examine The Revision Books”. While I was there I examined these books and also the in-house computer system. Both these areas are not yet available on-line but are only available to personal callers. It’s just another source that most may not be aware of!!! 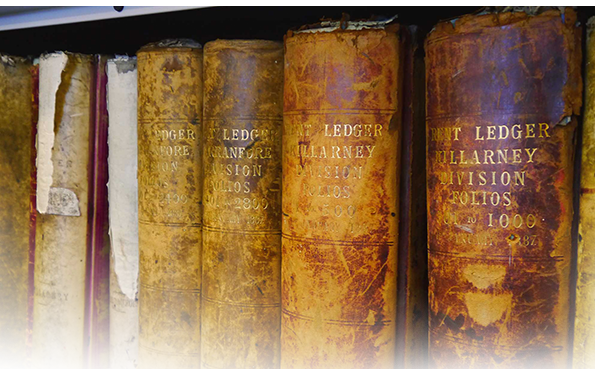 Tim, you are right – the Valuation Office in the Irish Life Centre, in my view is the most user-friendly of the history/genealogy ‘archive’ offices. We are lucky that Kerry is on the computer system and the staff are unfailingly polite and helpful. A few weeks ago I was there and came away armed with a huge envelope of Revision records for a number of townlands in Knocknagoshel. As I am on this tack now, I have to say that not the same level of help or co-operation is always evident on visits to the NAI or the National Library reading room. I have been working myself (as part of Ancestor Network), who have won the contract over the past number of years, in the Genealogy Advisory room in the NLI and there is a totally different atmosphere there – friendly and helpful also. This is a totally free advisory service for the public and also there is a bank of computers with free access to a number of paid genealogy websites. Thanks for the informative blog. While you have suggested above how to find the landlord, do you have any suggestions on how to find out if the landlord in question’s tenancy books are actually available anywhere? For example, tenants of Lady Headley around Glenbeigh – how could I find out if the Headley estate books are preserved? Steve, I don’t know if you have read my blog on the Headley estate here. There are some tenant records in the Local History Department of the Kerry County Library in Tralee, but the ones I have seen pertain only to the Knocknagoshel/Brosna area. An email to archivist@kerrylibrary.ie would be in order.